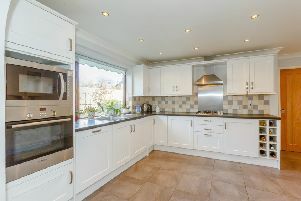 60A Kent Road, Harrogate - �650,000 with Verity Frearson, 01423 562531. In ages past, we all lived in single-storey dwellings. These were the days when people lived at one end of the building and animals lived at the other, separated by a central room with an open fire – the “fireroom” – where smoke would curl up to the rafters and escape through the thatch. Then someone invented the stone chimney and rich folk started being able to use that higher space for something more useful than just smoke. 116 Main Street, Little Ouseburn - �189,995 with Stephensons, 01423 324324. Yet it was only in the 16th and 17th centuries that stone chimney technology began to be used in poorer people’s houses, making a second floor of accommodation possible for the plebs too. But the single-storey layout survived in many parts of the world, not least in Bengal, from where it was re-imported to Britain. In fact, bungalow is a Gujarati term meaning “house in the Bengali style”. Originally a very modest dwelling, the term came to describe the prestige residences of the Raj, before 20th century developers borrowed it to describe smaller houses again. Their absence of stairs makes bungalows a popular choice among older people and those with inhibited mobility, but they can also offer an expansive sort of freedom that lends itself to open-plan living, and they’re popular with lovers of modern practicality. Rawdon, Back Lane, Copt Hewick - �399,950 with Dacre, Son & Hartley, 01765 605151. Nevertheless, they still only account for around two per cent of the UK’s housing stock, which is perhaps surprising, given that people living in bungalows have been found to be far happier with their property choice than their neighbours in multi-storey homes. The following three properties are bungalows of differing styles and represent the range of options available. In one of the most exclusive areas of Harrogate, 60A Kent Road is a modernised detached property with generous gardens extending to around a third of an acre. Being a dormer bungalow (rather than a ‘true’ bungalow) it has a first floor, where there are two bedrooms, a bathroom and plenty of storage space. On the ground floor there are two more bedrooms, a shower room, large breakfast kitchen, utility room, living room, garden room and adjoining single garage. Outside, there are extensive gardens, an ornamental pond and woodland, plus a long drive for off-street parking and and extra garage. In Copt Hewick, near Ripon, Rawdon is a detached bungalow occupying a plot of a quarter of an acre with superb views across the village and beyond. It has three bedrooms, two bathrooms, kitchen, pantry, living room and sunroom – all on the ground floor. Outside, there are lovely gardens and a single garage. Finally, 116 Main Street is a semi-detached bungalow in the village of Little Ouseburn, in the Vale of York. Being a so-called ‘true’ bungalow, it has two bedrooms, a bathroom, kitchen, reception hall, utility room (with built-in storage cupboards) and living room – all on the ground floor. Outside, there is a driveway to the front providing off-street parking and manageable, low-maintenance gardens to front and rear, backing onto farmland and giving it far-reaching rural views towards the neighbouring village of Great Ouseburn.